Download Our Content Marketing Guide! Learn about Keywords, Personas and the Buying Process! Are you curious about content marketing and how it can help your business get found online? We've developed a 10 page Content Marketing Guide which focuses on Keywords, Personas and the Buying Cycle to help you get started. Identify the keywords that matter to your business and customers. Develop personas so you understand what makes your customers unique. Understand the buying process prospects go through so you develop content that's appropriate for each stage. To download Simple Marketing Nows' Content Marketing Guide, simply fill out the form on the right. 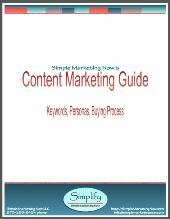 Here's How to Download Simple Marketing Now's Content Marketing Guide!